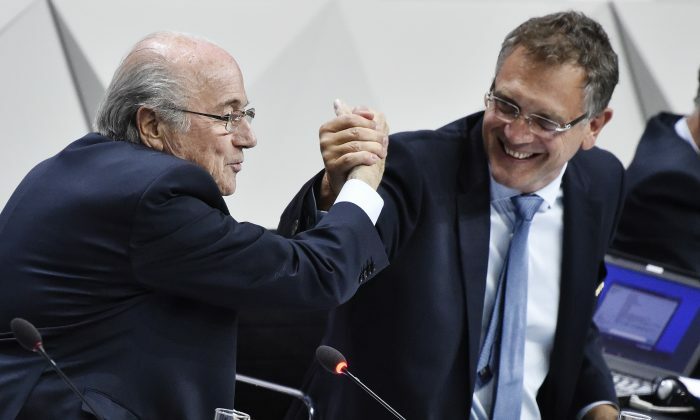 Sepp Blatter, Jerome Valcke, and Markus Kattner, top officials of the international governing body of soccer, FIFA, awarded themselves $80 million over their last five years in office, it was revealed on June 3. FIFA has been under fire since May 2015 after U.S. investigators exposed widespread corruption within the organization. The contracted payments seem to break Swiss law. Evidence shows Blatter received a $12 million bonus after the 2014 Brazil World Cup, and was also due another 12 million Swiss francs ($12 million) for his 2015–2019 presidential term. The secret bonuses were much more than the former president’s base salary—3 million Swiss francs ($3 million) in 2015—which was published by FIFA in March. Meanwhile, Valcke got a $2 million salary in 2015, as well as a $10 million bonus for the 2014 World Cup. He was due $11 million from the 2018 games in Russia. Three weeks after the newly-elected FIFA President Gianni Infantino claimed that “the crisis is over,” the turmoil within organization continues. Evidence will be given to the U.S. Department of Justice and Swiss federal prosecutors who are looking into the case, lawyers for FIFA said. The Justice Department declined to comment on the matter. “The evidence appears to reveal a coordinated effort by three former top officials of FIFA to enrich themselves through annual salary increases, World Cup bonuses, and other incentives totaling more than 79 million Swiss francs—in just the last five years,” said Bill Burck of Quinn Emanuel, the U.S. law firm retained by FIFA amid its corruption scandal. Additionally, FIFA stated it will refer the matter of these contracts and payments to the Ethics Committee for its review. The details of the contracts of the organization’s former president Blatter, fired former secretary general Valcke, and ousted finance director Kattner were revealed by FIFA just a day after a raid that attempted to seize evidence for the Swiss investigation. The office of Kattner, who was fired last week, was also raided. Michael Lauber, the Swiss attorney general, launched criminal proceedings against Blatter last September and against Valcke in March. Blatter and Valcke are accused of criminally mismanaging FIFA money, and have been banned from the organization for six and 12 years by FIFA’s ethics committee. Both former top officials have denied any wrongdoing. No additional criminal proceedings have been launched against recently fired official, Kattner. A year before the secret bonuses were revealed, the Justice Department announced nine FIFA officials and five corporate executives were indicted for racketeering conspiracy and corruption. “As charged in the indictment, the defendants fostered a culture of corruption and greed that created an uneven playing field for the biggest sport in the world,” said FBI Director James Comey at the time. “Undisclosed and illegal payments, kickbacks, and bribes became a way of doing business at FIFA,” he added. “The indictment alleges corruption that is rampant, systemic, and deep-rooted both abroad and here in the United States,” said Attorney General Lynch in May of last year. “It spans at least two generations of soccer officials who, as alleged, have abused their positions of trust to acquire millions of dollars in bribes and kickbacks,” she added.